Silas Lim, 29, started this food stall last October with Desmond Yong, his business partner and Ophelia Lim, his girlfriend and also his business partner. He has worked eight years in marketing for a restaurant and then as a bartender at Tippling Club and Smoke & Mirrors followed by head bartender at Ding Dong. The stall is located in Brunners Coffeeshop at the corner of Jago Lane along East Coast Road, this is one of the remaining coffee shops in this area, there used to be another one at the junction of East Coast Road and Joo Chiat Road but has closed down. They have also founded another stall by the name of Kampung Bowl right next to their current stall in the same coffee shop, serving homely Asian-style rice bowls. Silas has grown to love burgers during his exchange program in Oregon, America when he was doing an arts degree at NUS. 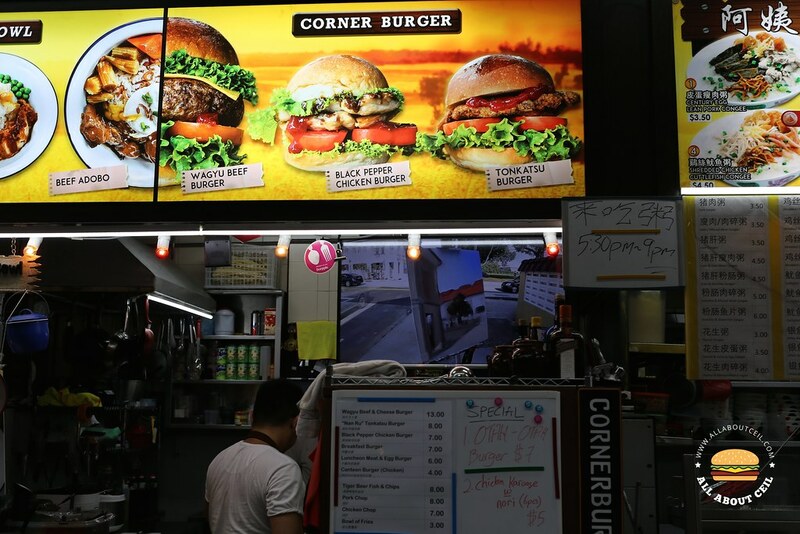 He felt it is difficult to find a good and affordable burger in Singapore thus he decided to start this stall to serve great burgers that he would eat it himself at reasonable prices. He is also one of the recipients of $10,000 grant from the Tiger Street Food Support Fund and he shared part of it with his neighbours at the coffee shop and the rest in equipment. He decided to become a hawker as he is hoping to bring forth a positive change though running a hawker stall is challenging but he perceives this as a starting point. His late grandmother is the inspiration behind this stall as he used to cook and experiment recipes with her at home, most of his recipes are influenced by her cooking. 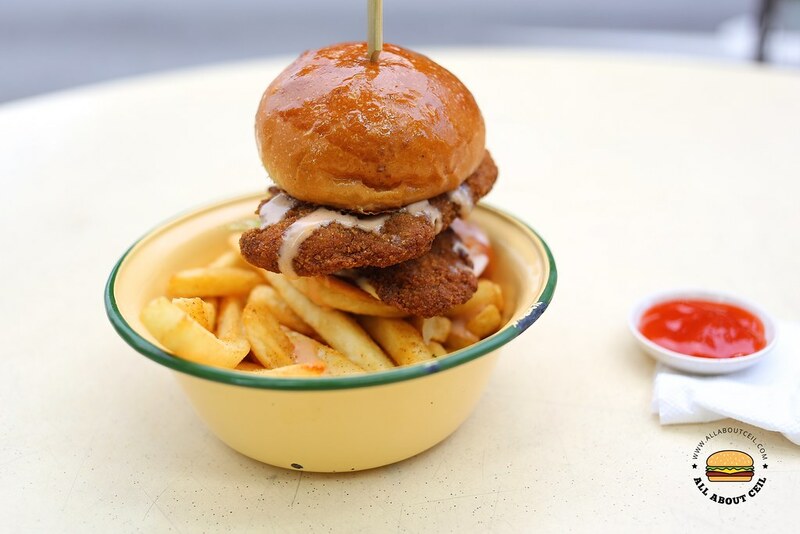 There are 6 types of burgers on the menu and the most popular has to be their signature Wagyu Beef & Cheese Burger ($13), there are also "Nan Ru" Tonkatsu Burger ($8), Black Pepper Chicken Burger ($7.00), Breakfast Burger ($7), Luncheon Meat & Egg Burger ($6.00) and Canteen Burger ($4.00). 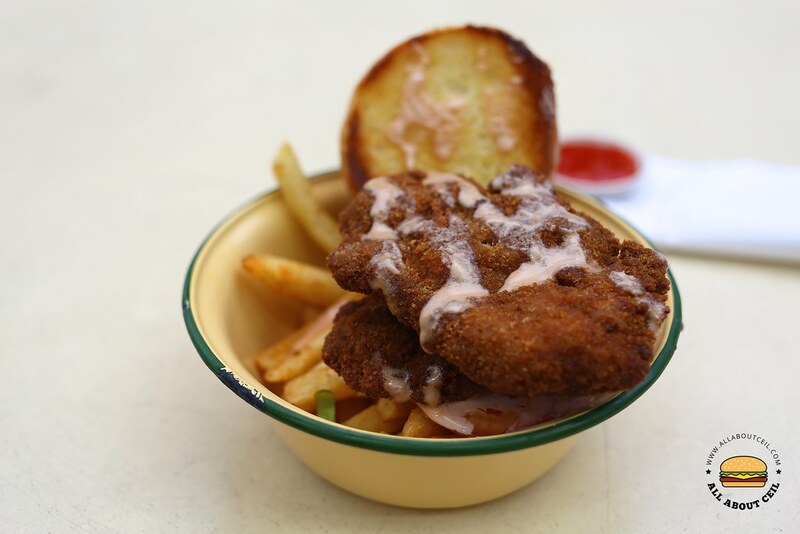 Other than burgers, the menu includes Tiger Beer Fish & Chips ($8.00), Pork Chop ($8.00), Chicken Chop ($7.00) and Fries ($3.00). The burgers are served along with thick-cut fries. 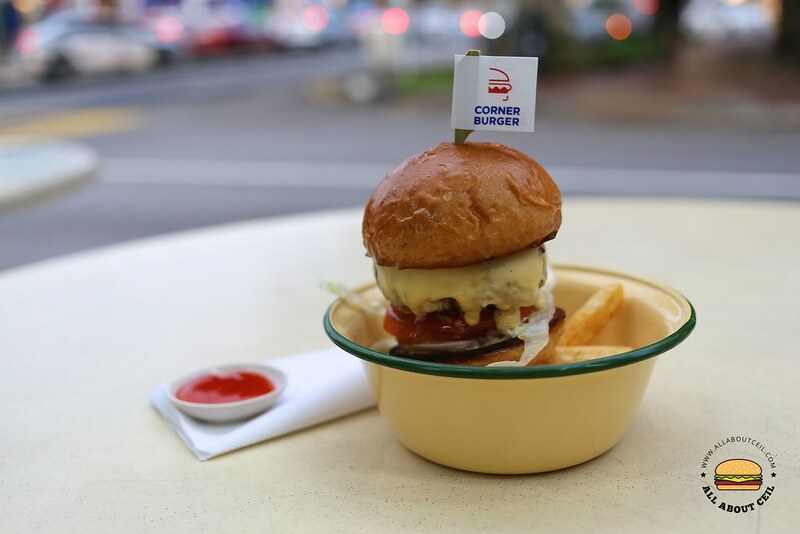 The Wagyu Beef & Cheese Burger ($13) consisting a well-seasoned and firm patty that is made of Australian wagyu chuck and sirloin. 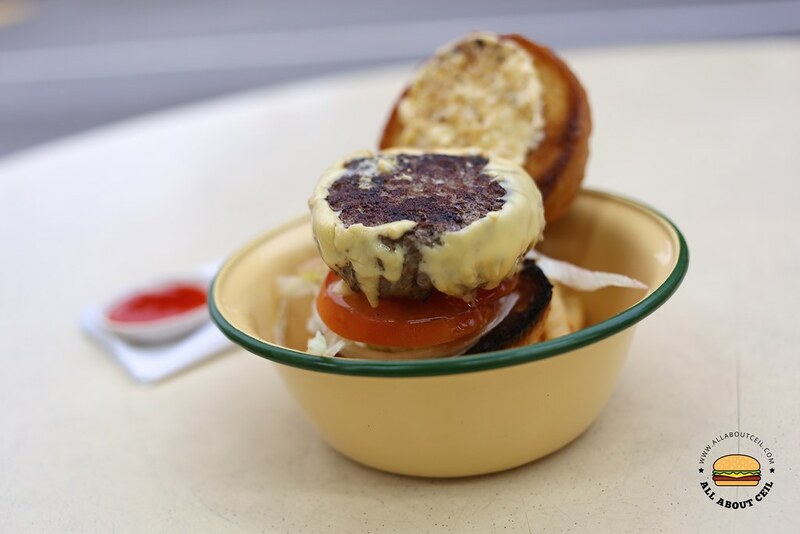 It served together with melted cheddar cheese, lettuce, tomato sandwiched in between lightly toasted artisan buns from Enjoue Bakery, an artisan styled bakery at Joo Chiat. The enamelware bowl that it came with brought forth a wave of nostalgia. The patty was nicely charred to give it a slight crisp and still tasted juicy. Those fries were lightly salted and it did not turn soggy even after left it for a while. Apparently, I did not like their "Nan Ru" Tonkatsu Burger ($8) as much. The pork collar fillets were marinated in the 'nan ru' (fermented tofu) first then breaded and deep-fried, the texture was a bit too hard for my liking and the 'nan' ru' flavor was a little overpowering as well. I am looking forward to trying the Breakfast Burger ($7) which consists of harsh brown, luncheon meat, bacon with egg and I will order something from Kampung Bowl when I return.